SOC is defined as the status of available energy in the battery and usually expressed as percentages. Because the available energy change depends on different charging/discharging currents, temperatures and aging effects, the SOC could be defined more clearly as ASOC (Absolute State-Of-Charge) and RSOC (Relative State-Of-Charge). Typically, the range of RSOC is from 0% to 100%, a fully charged battery’s RSOC is always 100% and a fully discharged battery has 0% RSOC. The ASOC is a reference calculated by Design Capacity which is a fixed capacity from when the battery is manufactured. 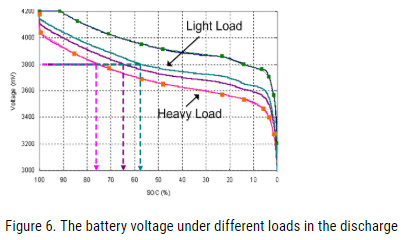 A fully charged new battery will have 100% ASOC, but a fully charged aging battery could be less than 100% because of different charge/discharge conditions. Battery management is part of power measurement. The fuel gauge is responsible to estimate the capacity of battery in the domain of battery management. The basic function of fuel gauge is to monitor the voltage, charge/discharge current and battery temperature, and to estimate the battery’s SOC and Full Charge Capacity (FCC) of battery. There are two classic methods to do the SOC estimation which are Open Circuit Voltage (OCV) and Coulomb Counter, respectively. The other method is dynamic voltage-based algorithm designed by RICHTEK. This entry was posted on Sunday, October 7th, 2018 at 1:15 pm	and is filed under app notes. You can follow any responses to this entry through the RSS 2.0 feed. You can skip to the end and leave a response. Pinging is currently not allowed.